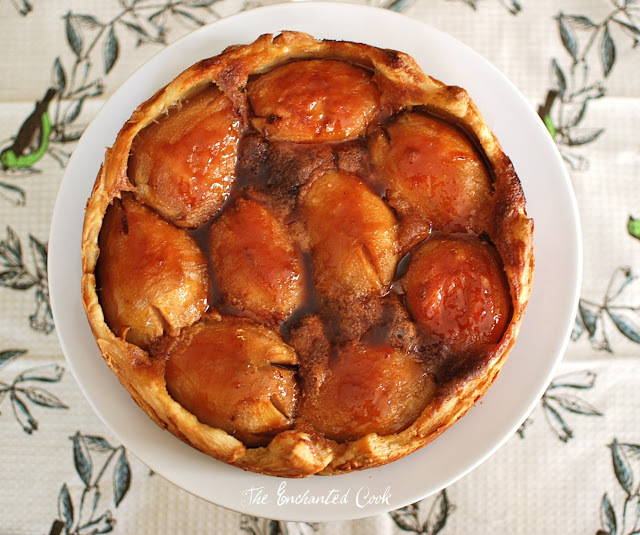 This pear tart was so elegant yet so easy to make. The ready-made puff pastry saved several steps, leaving time to dote on the luscious pears in their spiced-caramelized sauce. Hints of cinnamon and vanilla along with cloves and star anise made me feel all cozy and ready for fall. Add this to your holiday meal for a nice change of pace from the standard pumpkin pie. I found this recipe in this month's (November 2010) Bon Appetit magazine. It's completely fabulous, as is everything else I've made of theirs. You can get the crust ready the day before and work on caramelizing the pears and making the filling the day of. You can prepare both (pears and filling), then leave them sitting out for up to 6 hours while you make the rest of your holiday meal, then bake while you eat, and your tart will be ready to serve warm by the time your guests are ready for dessert. Allow puff pastry to thaw for about 20 - 30 minutes, then roll out to about a 12 inch square and trim off the corners to make it round. Transfer puff pastry to 10 inch round springform pan pressing pastry firmly onto bottom and 1 to 1 1/2 inches up the sides of pan. Cover with plastic wrap and put in freezer until firm about 1 to 1 1/2 hours or up to one day. Not pretty but it still came out great! Melt butter in heavy large skillet over low heat. Add sugar, cinnamon stick, star anise, cloves, and coarse kosher salt. Scrape inside of vanilla bean and add, also add pod. 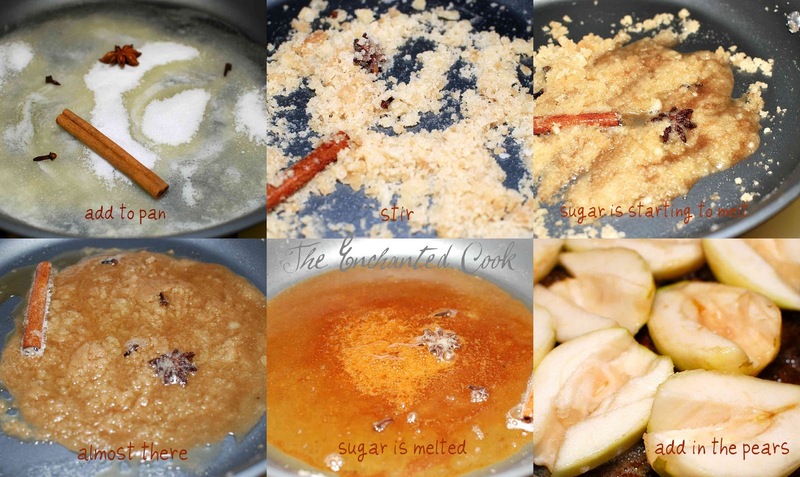 Increase heat to medium-high and cook, stirring until sugar melts and turns brown, about 3 minutes. Reduce heat to medium and add pears, rounded side down. Cook until pears are tender, turning and moving skillet around occasionally to ensure even cooking, about 10-15 minutes. Carefully turn pears over and continue to cook until pears are very tender, about 10 minutes longer. I forgot to throw in the pod after scraping the inside of the vanilla bean but it was still great. Remove skillet from heat and cool pears in skillet with spices (pears will release juice while cooling). Melt butter in small saucepan over low heat. 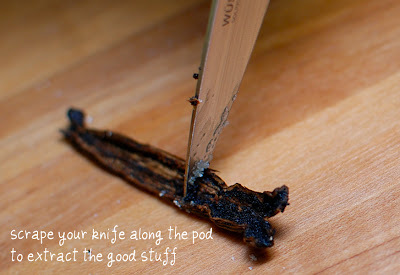 Scrape inside of vanilla bean into saucepan and add pod. Add cinnamon sticks, star anise, and cloves. Increase heat to medium and cook until butter is golden (watch to avoid burning), about 3-4 minutes. 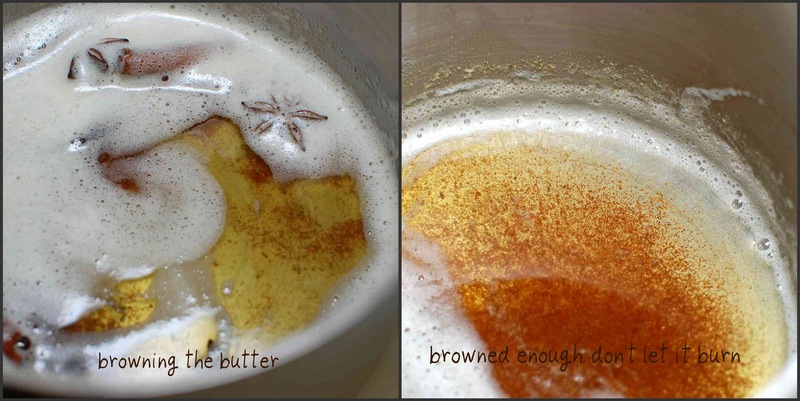 Remove vanilla bean and spices from butter and discard. In medium bowl, whisk sugar, egg, and coarse kosher salt, then whisk in flour. Gradually whisk browned butter into egg mixture. Do not add all at once or eggs will cook. Position rack in center of oven and preheat to 400 degrees F. Brush frozen crust with beaten egg white, then spread filling into bottom of crust. 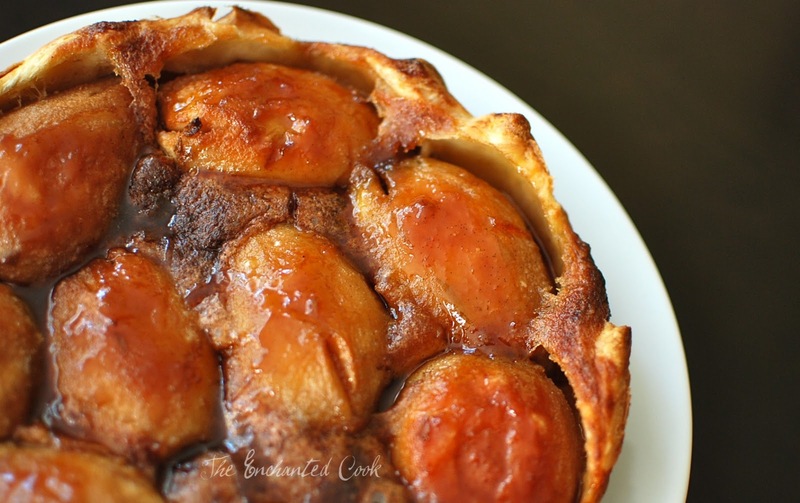 Using a slotted spoon, gently remove pears from skillet and arrange on top of filling in crust. Reserve syrup and set aside. Bake tart until crust is deep golden and filling is set and brown at edges, about 1 hour. Remove from oven. Run a small knife around sides of pan to loosen tart. Release pan sides and transfer tart to platter. Let stand, uncovered, at room temperature to cool slightly until just warm. Meanwhile, boil syrup in skillet until reduced by about half, about 1-2 minutes. Discard spices. Drizzle syrup over pears and serve immediately while still warm. Veronica - this looks SO good! Very pretty presentation!! Are you serving this for Thanksgiving next week? My husband won't eat pears, but assume I could sub in a firm baking apple instead. Hard to believe that Thanksgiving is NEXT week...eep!! Thanks Wendy! I bet apples would be great in this as long as you get them good and tender. The pears just melted in my mouth! I can't believe Thanksgiving is next week, either! Not sure what dessert I'll be making yet. I made a Thanksgiving-like meal this past weekend which is when I made the tart. It was wonderful! We may end up with just the two of us on Thanksgiving and pack a meal to take to the beach - still up in the air for now. I promised myself I would stop baking on my way in to work this morning. I might have to make an exception for this. Looks amazing. This looks DELICIOUS!! I cant wait to try it out :)! this looks very elegant..perfect holiday dessert. WOW .. this looks amazing. The pears get such a beautiful color and the final product looks so elegant! I REALLY want to try this one! Great pics! OMG, Veronica, this looks so amazing! It turned out so beautifully. I'm going to have to try this one. This look absolutely amazing..recipe and the photos! yummy! What a lovely pear dessert! This is beautiful! I would love to see this at the end of a holiday meal! So much more creative than pie ;)! What Does a Foodie Do for Fun?